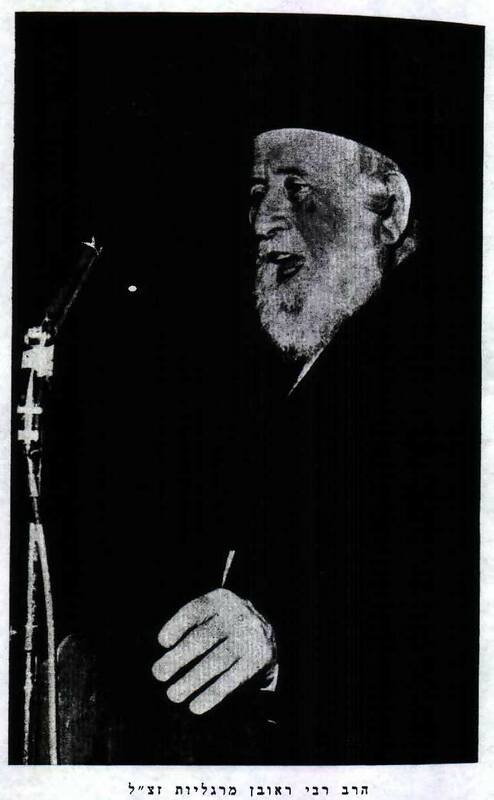 Reuvein Margolies, (Hebrew: ראובן מרגליות) (November 30, 1889 – August 28, 1971) was an Israeli author, Talmudic scholar and head of the Rambam library. Margolies was born in 1889 in Lemberg (now Lviv), then part of the Austrian-Hungarian Empire and now in Ukraine and from 1918 to 1940 in Poland. He emigrated to Mandate Palestine in 1934, settling in Tel-Aviv. Margolies authored over 55 books on Jewish topics. He possessed a photographic memory, and was well versed in all aspects of both the written Bible, Oral Torah (Talmud and its commentaries) and Kabbalah (Zohar etc.). He established the Rambam library. He wrote on a wide range of subjects; His works were meant for both scholars and laymen alike. All of his writings are in Hebrew. He wrote on the formation of the Mishna and the Talmud displaying originality in thought, and a wide range of knowledge. He further wrote on the Kabbalah. Such works include "The Rambam and the Zohar" demonstrating correlations between Maimonides Mishna Torah and the Zohar; Nitzotzei Zohar demonstrating correlations between the Tannatic and Amoraic works (such as the Talmud and Medrashim) and the Zohar. He was also involved in a controversy with Gershon Scholem over the Rabbi Jacob Emden/Rabbi Jonathan Eybeshuetz controversy. Margulies produced a pamphlet defending R. Eybeshuetz and in response Scholem produced his own disagreeing with Marguleis's conclusions. He wrote a number of scholarly biographies of major Jewish personalities such as Maharsha, Ohr Ha-Chaim Hakodosh, Noam Elimelech, Rabbi Moses ben Nachman (Ramban), and R' Yechiel of Paris including valuable annotation clarifying ideas in their works. The biographies focus primarily on their methods of scholarship and not on their personalities. First printed in Poland, they were never reprinted. He wrote several works concerning the development of a legal system in the newly formed Jewish State (Kavei Ohr, Tal Tichye). According to Dr. Yitzchok Raphael, his writing is in a terse style designed to concentrate a maximum amount of information in a minimum of space. In 1957, Margolies was awarded the Israel Prize for his work on Rabbinical literature. Toldot Adam (Lemberg 1912) on R. Shmuel Edels, also known by the acronym "Maharsha"
Kavei Ohr and Tal Techiya (Lemberg 1921), two volumes on Jewish law in the Land of Israel, and essays on various topics, including "Medicine and Healers in the Talmud", "The Laws of Ger Toshav", and the first printing of "Yesod Hamishna Va'arichatah"
Shaarei Zohar (Jerusalem 1957) notes on the Talmud directing one to the relevant passages in Zohar. Peninim U'Margoliyot A posthumously published collection of essays. There is also a memorial volume edited by Dr. Yitchak Raphael and published by Mossad R' Kook, which describes these and more books in more detail. This page was last modified on 4 October 2015, at 21:04.